​I am willing to bet that I wasn't the only Francophile enchanted by Luke Nguyen's television series France, which screened in Australia on SBS. In it, the Vietnamese - Australian celebrity chef tours France, learning about classic French dishes and creating his own unique French recipes with a distinct Vietnamese twist. Having purchased the DVD, I'd watched the whole series several times. But once I’d confirmed that we'd be spending time in Strasbourg on a recent family trip, the episode that featured Strasbourg was on high rotation in our Melbourne home. 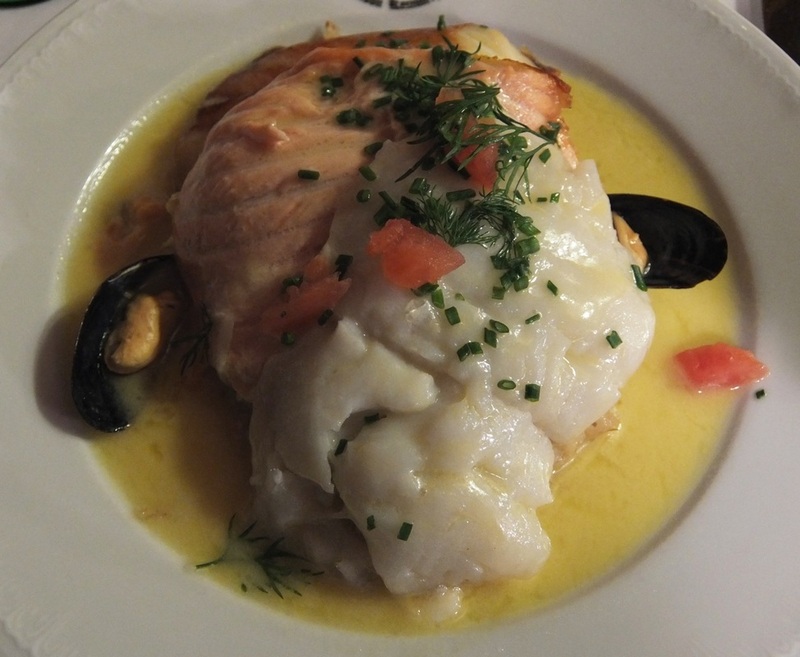 I was especially interested in Luke’s insights into Strasbourg’s famous restaurant Maison Kammerzell and in particular, the renowned (if not exactly traditional dish), Choucroute Aux Trois Poissons (also known as Three Fish With Sauerkraut). Now, given the time Luke spent featuring the restaurant, I was always going to check out both Maison Kammerzell and it’s special dish. But I have to tell you, I was a touch nervous about visiting Maison Kammerzell. The whole idea had ‘potential for distaster’ written all over it. The diner reviews on the internet were mixed at best. And questions like ‘Will the restaurant be super touristy?’, ’Why didn’t Luke mention whether the fish and choucroute tasted good?’ and ‘What if I don’t like fish and sauerkraut?’ kept coming up. But I needn’t have worried. Maison Kammerzell was fabulous - we ate there twice during our nine night stay in Strasbourg. And we would happily go back given the opportunity. Let me start with the restaurant itself. 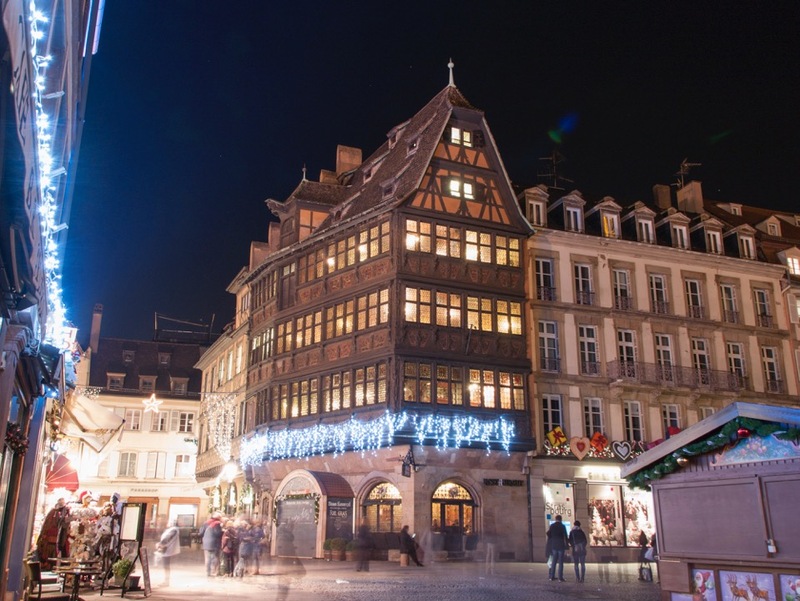 Situated right on the doorstep of Strasbourg’s intricately decorated and towering Notre-Dame Cathedral, you’ll find Maison Kammerzell in the heart of Strasbourg’s old town. I loved the fact that, from outside, the restaurant seemed to have grown organically over the years. The fabulous bottle glass windows covered part, but not all, of the building and the rooms seemed to jut out here and there. I shouldn’t have been surprised by the style of the building, given the original structure was completed in 1427. The restaurant interior is equally fascinating. The restaurant is made up of a number of dining rooms or salons - both small and large - over a multitude of floors. From what I could gather, each room was decorated quite uniquely. Some had wood panelling, others frescos and the aforementioned bottle glass was also used as a decorative highlight in some dining rooms. The ancient spiralling staircase is feature in and of itself, and the thick rope that hung down the centre of the stairway was extremely handy as you wound your way down after dinner. But while ambience is important, you eat out for the food. The menu offers a wide variety of choices, which looked like they would cater to most tastes. There are also two fixed price menus to choose from, both of which appeared to deliver good value for money. There were three of us dining on each visit, and between us we tried numerous, generous dishes including an amazing lamb dish, an excellent confit duck and some of the best choucroute we tasted in the Alsace. The entrées and desserts weren’t too shabby either! But the standout dish was definitely the famous Choucroute Aux Trois Poissons that Luke Nguyen had cited. I tried it on my first visit - and could not believe how well the flavour combination worked. And the Salmon and Choucroute that I ate on the second visit just couldn’t compare - I’m kicking myself for not ordering the Choucroute Aux Trois Poissons again. According to the menu, this particular creation was conceived by chef Guy Pierre Baumann in 1970. Comprising poached salmon, halibut and smoked haddock, resting on the house-made sauerkraut the tastes were tied together with a beurre blanc sauce. We were instructed by our waiters to eat our fish in a specific order - the light halibut first, then the salmon, followed by the haddock. Two freshly steamed mussels acted like punctuation marks and were eaten last. While Baumann’s creation might have raised the eyebrows of the purists, I fully understand why the dish has been on the Maison Kammerzell menu for over 40 years - it is quite simply, delicious! When it came to service, we found the waiters at Maison Kamerzell to be spot on. On both the occasions we visited the waiters humoured (tolerated?) my attempts at French and happily accommodated our son’s preference to speak English. All the staff were keen to assist us, and the wine recommendation we received on the first visit was so good, we didn’t even have to think about which wine we ordered on the second visit! From my point of view, the dress code was fairly relaxed. It was winter when we ate at Maison Kammerzell, and jeans and dressy jumpers seemed to be the order of the day for both men and women. We managed to eat at Maison Kammerzell twice without a reservation. Having said that, I’d recommend booking to avoid disappointment. On each occasion we visited, the restaurant was very busy - but not so busy that it impacted service levels - and we noticed long queues at the restaurant on Friday and Saturday evenings. You can make reservations through the Maison Kammerzell website. 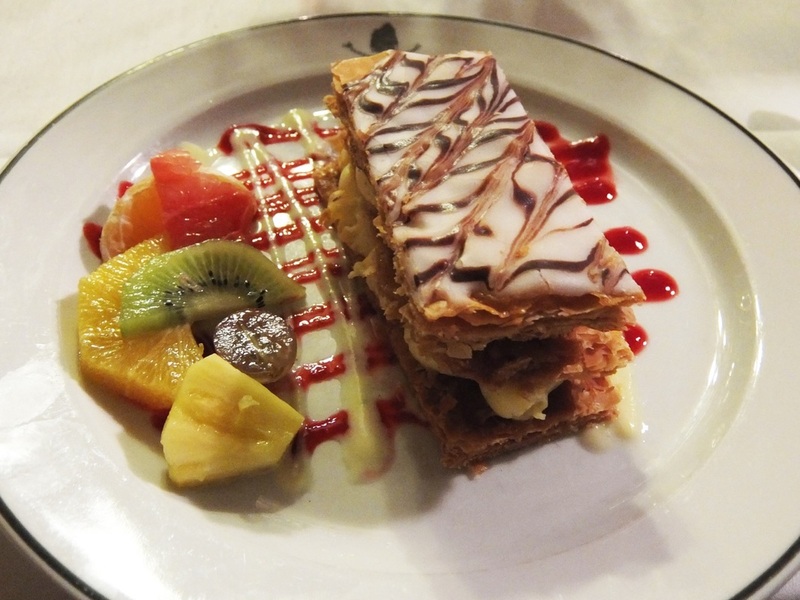 Millefeuille à la vanille - yum! ​All in all, it was easy to see why Luke Nguyen had taken a film crew to Maison Kammerzell. A historic building and an iconic dish are hard to pass up. I definitely recommend you too make a beeline for Maison Kammerzell if you are ever in Strasbourg. I know I certainly will if I am ever lucky enough to go back.